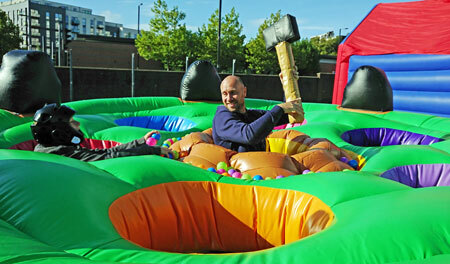 This is our inflatable human version of the arcade game 'Whack-a-Mole'. Six participants compete to collect as many balls as possible while avoiding the 'gardener' in the middle who has the job of bashing them over the head with his foam hammer/spade every time they pop their heads up from their hole. Please note that this game is suitable for teenagers and adults only as you need to be 4ft 10in to be able to reach through the holes. The game requires an operating area of 18x18ft and is supplied with a member of staff to supervise its use. A weather shelter can be provided bu this increases the space required to 24x24ft. Its great fun to both participate in or watch and is a game that gets lots of attention. 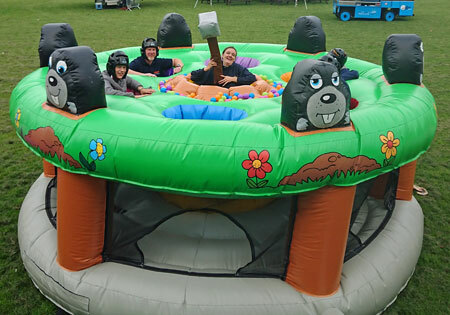 If you have any queries, questions, or would like to make a booking for the hire of our inflatable Whack a Mole game please call or click the button below to enquire and we will do all we can to help.